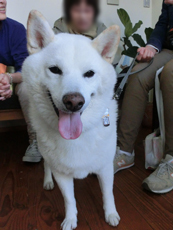 We held an adoption event at FIELDNOTE in Nara on 27th Oct. (Sun). 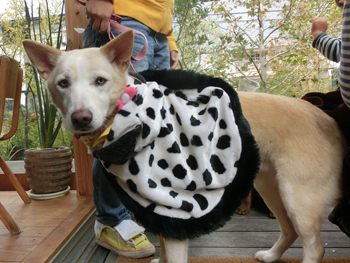 It usually rains when we have adoption events in Nara. But the last two times, and this day too, we had wonderful weather. 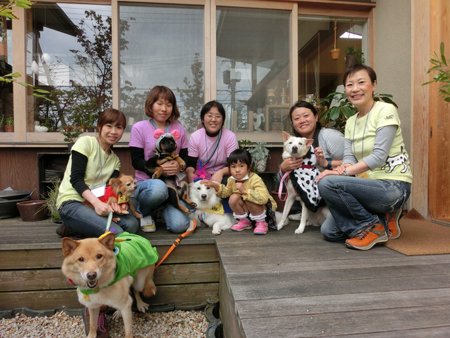 Thanks to the great weather, a lot of people and dogs came to the event. 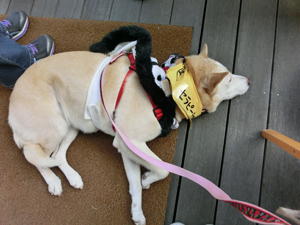 All the dogs welcomed them in costumes because Halloween was coming up. 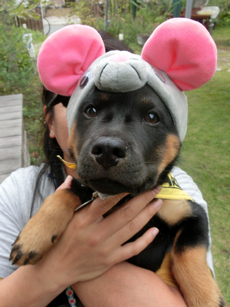 Puppies are always the most popular dogs at events. This time, it was Tenner. Although he is such a young puppy, he can tell which people he’s met before and which people he hasn’t. He asks people whom he knows for affection while he is shy to strangers when they get into his kennel for the first time. 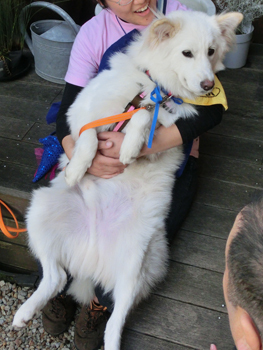 This event was a great opportunity for him to socialize since many people held him and children petted him constantly. About 5 families considered him but they were all surprised that we don’t want dogs to be kept only outside. We may have a long way to go about changing the traditional idea of keeping dogs outside. There are many advantages to keeping dogs indoors: dogs love to be with their family; it makes it easier for both humans and dogs to communicate with each other; we can notice small changes in the dog which could help us notice if the dog is sick. 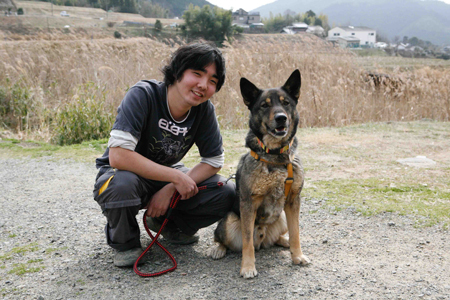 Many people who adopted ARK dogs said that it was their first time to keep a dog indoors. They did it because it was one of ARK’s policies and they found that it really is the right thing to do. Of course, some dogs were used to being kept outside before they joined ARK and still prefer being outside to inside. However, most dogs will love to live in the house. We spent a lot of time with people and explained the rationale for our policy. One family told us that they would have a family meeting and visit ARK. We appreciate their consideration and will wait for their visit. Okowa took part in this event again after her first participation at the spring event. She seemed happy walking around off leash and she played with people. Her coat shines and she eats as if she were a puppy. Can anyone believe she is a 14-year-old dog? It’s been about a year since she came to ARK. It is an exceptional case that a small dog with no physical and behavioral issues like her doesn’t find home for over a year. 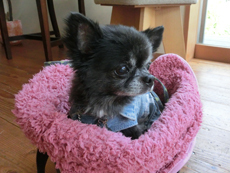 Potential adopters who want a small dog worry about her age. 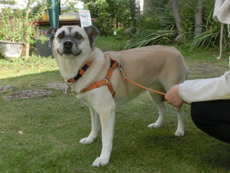 Other people say she will find a home easily so they give a chance to a dog that is harder to adopt. But it’s been a year! Please don’t hold back! Adopt Okowa! This is Therapy, a quarter Siberian Husky. 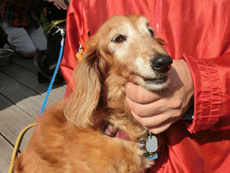 She behaved so nicely that many people believed she was a therapy dog. 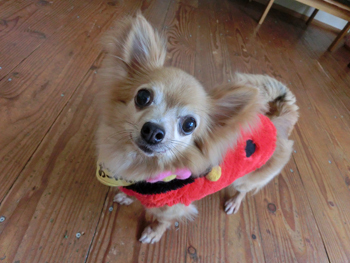 She was kept by a homeless person in Osaka City; therefore, she wasn’t afraid of strangers even in city areas. 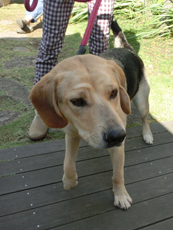 We think she is the type of dog who is likely to find her own home very soon. However, she hasn’t yet. On this day, a family paid attention to her! They will visit ARK in near future so let’s see if she will win her own home. Therapy: As the phrase goes, “Good things (may) come to those who wait”. This was the 2nd time to be in an adoption event for Piano. Now nobody will believe how skinny she was when she came to ARK (and she’s gone a bit too far to the other side???…). She showed her “Give me some” to people. Representing the 34 dogs from the mountain, a good-looking guy, Khalid, joined the event. 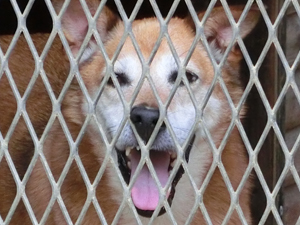 In the kennel, he copies other dogs and barks so much that he keeps failing to give a good impressions to visitors. 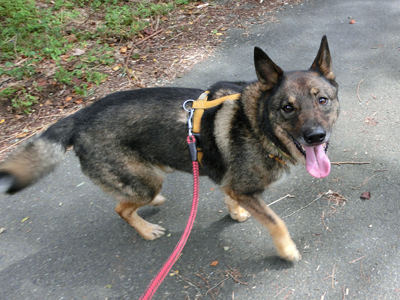 However, he is actually a good dog: he loves to receive affection and is absolutely handsome! He was a little stressed at the event and couldn’t urinate until he got back to ARK! However, he could eat and behaved well when children petted him. 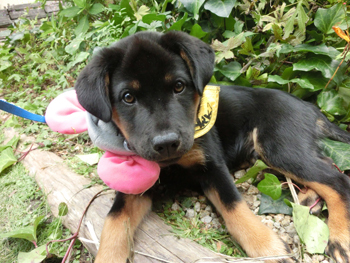 He would get used to life at home in a short time if his new family understands his character. 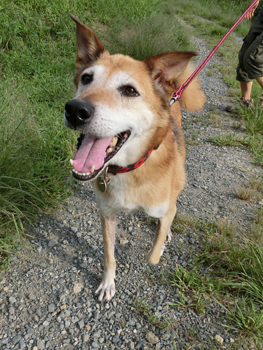 Would Khalid be the 4th dog among the 34 dogs from the mountains to be re-homed? 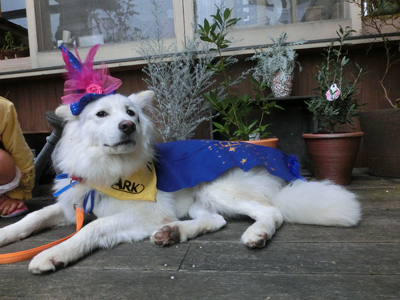 Also, we had a lot of dogs who used to be members of ARK! Please forgive us that we couldn’t take pictures of all of them. 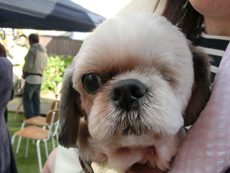 It is one of the best moments for the ARK staff when we see how happy and beautiful all our previous dogs have become. We are looking forward to seeing you again! Last but not least, we would like to extend our appreciation to FIELDNOTE for giving us this opportunity again. Also, we are grateful to the bakery shop and volunteers for their donation and support! “Hello everyone. I’m Katou and I’m Rikinosuke. Today’s article features our area, K3! K3 stands for “Kennel 3”, which is located a short distance away from the office and other kennels you see when you visit ARK. 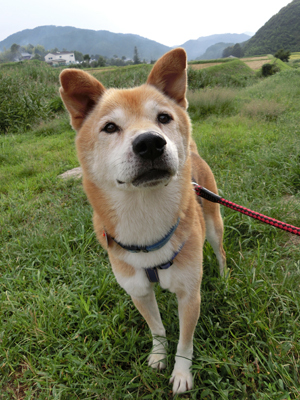 In K3, there are dogs which are extremely shy around people, and they will be under stress when visitors come. 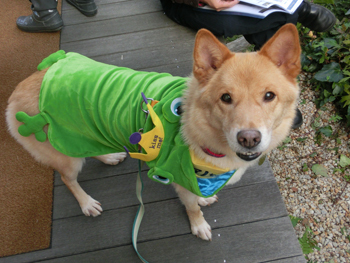 K3 also houses dogs that have their own home in Fukushima but temporarily live here. 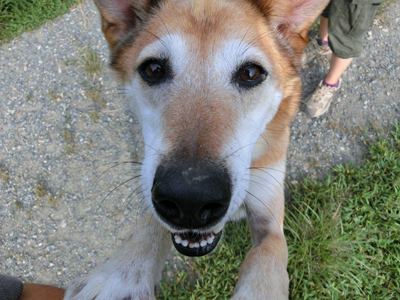 We usually have few opportunities to meet people so please let us introduce some of the K3 dogs!" This old gentleman is Han. You may know him because he is included in this year’s ARK Calendar. This is a picture of us when we were young. 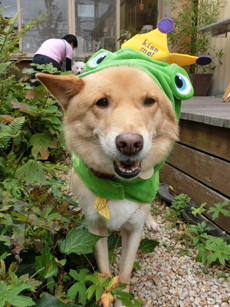 I heard that Kyou passed away last year. 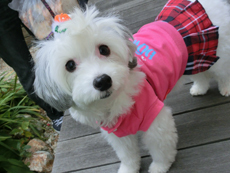 “I have been living with a tiny one named Momotaro since Kyou was adopted. Momotaro doesn’t want to share blankets or towels with me even though I love them very much. However, as an adult dog, I have and will never be mean to him for such behavior. The staff always calls me a “gentleman” and praises me for my kind behavior. 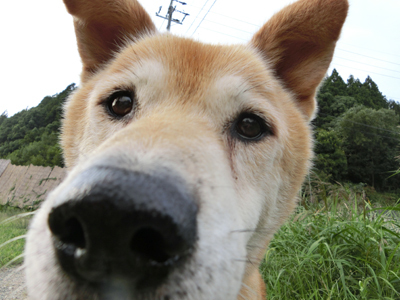 In Nose, where ARK is located, the temperature goes sub-zero in winter and close to 40 degrees Celsius in summer so it must be hard for old dogs. However, it will be all right. When the Sanctuary in Sasayama is built, you can live more comfortably there! 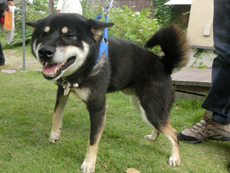 The next dog is Otsuru! “Hi, all! I do love to eat and to walk! I spend most of the day sleeping but it doesn’t mean that I don’t like to walk. 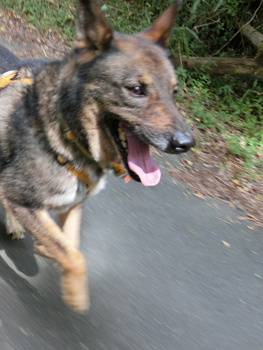 Actually, I am always so excited to go for a walk that I keep jumping till they take me out! 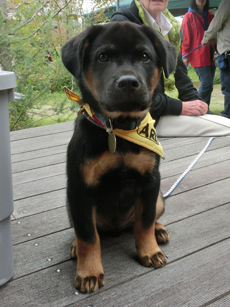 “I’ve been at ARK since I was a puppy and living at ARK is not as bad as some of you may think. 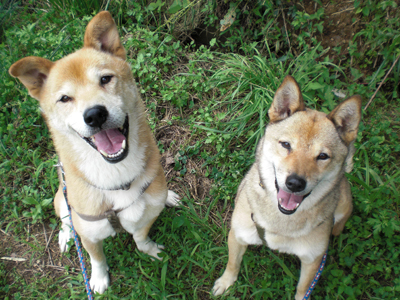 However, it would be great to live with “my own family” like my sisters, Chimaki and Mocchi do. The staff always tells me how wonderful it will be when I find my own home. Dear Otsuru, we are not giving up! That’s why we are introducing you in this article! Then, the last one for this article is me, Rikinosuke. 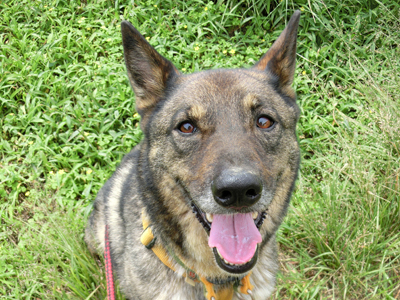 I once was at a pet shop and I am a mix of Australian Cattle Dog and Norwegian Elkhound. A quick Internet search will show that both of those breeds are working breeds. That means I am smart and I feel joy through working. I feel stressed if I don’t have a job to do. Sadly, my first owner knew nothing of my breed and that’s the reason I came to ARK when I was 1.5 years old. As for my personality, I do love people and I am very good at remembering people who’ve meet me. I also love to go for a walk and I always enjoy it. What I am not good at is dealing with other dogs. 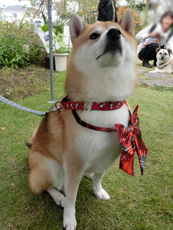 I didn’t have any chance to play with other dogs when I was young, so I have no idea how to behave around them. That will explain the reason why I bark at dogs when they pass by my kennel. 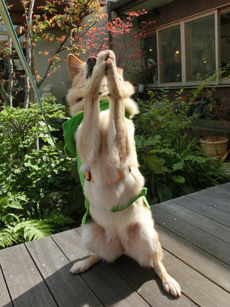 Once a dog trainer adopted me but the barking, which is sort of my instinct, could not be fixed by training and I returned to ARK. I am going to be 7 very soon and now I am calmer than I was when I first came to ARK. Is now my time to be rehomed? What do you think? We will be very happy if you consider these K3 dogs including me!